the brush on the inside edge of the jar to allow all of the excess powder to fall back into the jar. With the brush, firmly (but gently) apply the ShaBo powder onto the thin areas of your scalp or onto the (gray re-growth) roots that you see. This will transfer the color from the brush to your scalp. You don’t need a lot of powder, you just need the color. Use any spray or styling products you like . This Travel Brush "Shaker" is perfect traveling, will fit in your purse , or to cary in the glove box of your car. 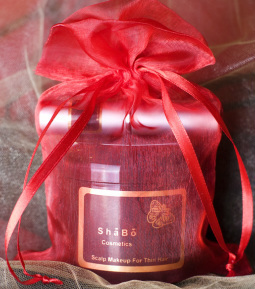 Remove ShaBo Travel Brush from all plastic packaging. Gently tap the brush on your hand two or three times to load the brush. Remove plastic cap from the brush. With your thumb and finger on the plastic covering, gently twist the plastic tube to extend the brush. 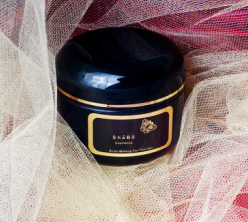 Apply ShaBo Scalp Makeup pressing firmly against your scalp blending ShaBo over the roots. To reload the bristles, gently shake and re-apply to your scalp. Caution: Do Not hold over your clothes while loading the brush. Product will fall .